When you think of Costa Rica, coffee has to be one of the top things that comes to mind, as Costa Rican Arabic coffee is among some of the best coffee in the world. God saw fit to place us right smack dab in the middle of one of the coffee capitals in Costa Rica, with most of our long-time Costa Rican farming families surrounding us having beautiful and bountiful coffee farms that go back for generations. The farm that we live on in San Ramon, Costa Rica, was used as a coffee farm in the past. It has been our desire to try to honor the tradition and legacy of the families not only surrounding us but those who have been on our farm before us by reviving and adding to the coffee on the farm. So many of the things that the Lord has seen fit to have us learn while we’ve been ministering here have been understanding from a first hand perspective how Costa Ricans live. 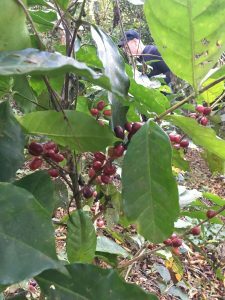 Since coffee and Costa Rica go together, and we live in an agricultural community, we knew that having coffee on our farm was a necessity. 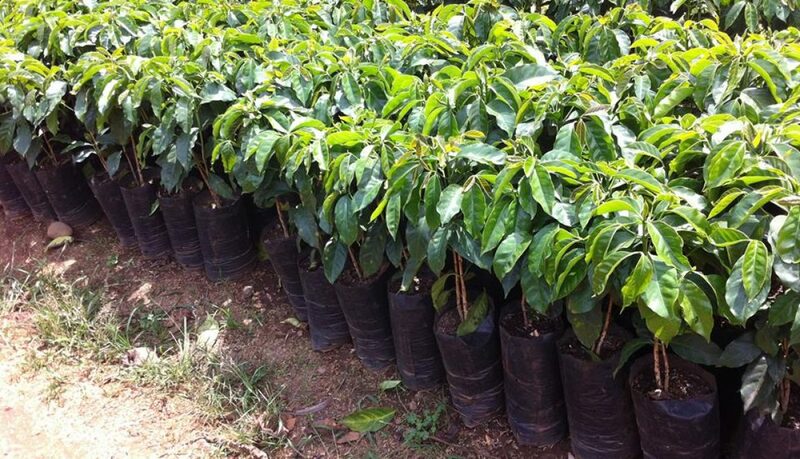 We planted approximately 1000 coffee plants several years ago, and they are to the point where they are beginning to produce! There is something incredible about enjoying the aroma of the flower, seeing the colors of the coffee fruit as it grows and matures, and then being able to participate in the timeless tradition like harvesting coffee. Tim and I had some time the other day to hike (and I mean, HIKE!) down to the coffee area of our farm. 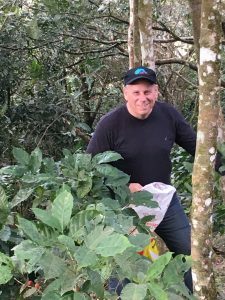 It turned out to be one of our favorite moments here in Costa Rica as we spent the afternoon picking our cosecha (harvest) of organic coffee beans right off of the plants we and our faithful partners/helpers so painstakingly put in the ground all those years ago. The tranquility of the light afternoon breeze while we were tucked in the shade of the surrounding protective trees, toucans in the distance, parrots flying overhead, and thanking God for all of the great things that He has done. Harvesting coffee takes a lot of physical strength – we have watched over the years as the Costa Ricans gather their entire family together, from the smallest children up to the grandparents and patriarchs to pick the coffee that they have worked so hard all year to take good care of for a grand yield. We have also experienced being at the border of Costa Rica during coffee harvest season, both on the North in Nicaragua and at the Southern border with Panama, as the mostly indigenous wait patiently in line for days at immigration for an opportunity to come into Costa Rica and help harvest coffee to bring money back to their respective countries to support their families. It is not uncommon to have those migrant workers, able only to sign their names by a fingerprint, in our neighborhood working on the sides of very steep hillsides in some pretty daunting heat for several weeks before heading back to their homes abroad. It is our desire to meet their needs of food and drink during the coffee harvest each year with the hope of showing them the love of Jesus and sharing the gospel with them – a harvest in two ways! 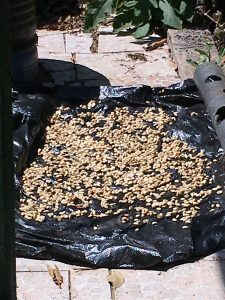 This year’s coffee yield on our farm was small as it is just beginning to produce, but we are still thrilled that we are on our way to providing our own organic Arabic coffee for our family, friends, guests, and those in need. Coffee time is all of the time in Costa Rica, and you can count on ‘cafecito’ at regular intervals, without fail, every day: 9am, 3pm, 6pm. It doesn’t matter what you are doing, or where you work, those are sacred times for a cup of coffee and a moment to stop and enjoy the day. The importance of coffee in the Costa Rican culture can’t be overstated – it is something that is necessary to make a part of your life to get a truly unique experience here! Of course after working on the side of a mountain, even for one afternoon, you have the daunting task of carrying your harvest back up the hill! This year we were able to handle what we picked … in the future, we will definitely need to call out for reinforcements! Picking the coffee is just the beginning of the harvest, however. 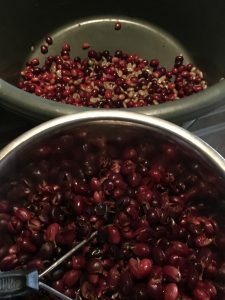 Once you have it off of the plant, there are quite a few ways (and a few old school tricks) to separating the bean from the fruit. 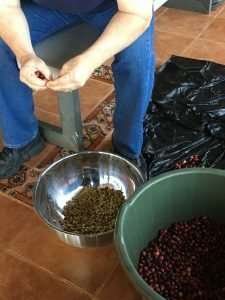 One of our patriarch neighbors, Ethel, told us that they bring the coffee bags up and actually drive their car over the fruit to break the outer casing in order to easily remove the bean inside (in tact, even!). You can hand separate it, as we did here – but you will soon learn that you would do better off with a whole lot of people to save the use of your hands for other things in life! 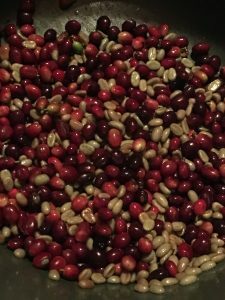 After the work of separating the bean from the fruit, comes the drying process. We take the pulp, or seedless fruit, and use it as a natural fertilizer to better feed the soil and recycle all parts of the plant. Then we place the beans in on the shelves in our greenhouse at night to avoid any moisture in the air, while setting them out in full sun during the day for the quickest natural drying method. This process can take several weeks, so patience is a necessity! We continue to be grateful for every opportunity and experience that the Lord blesses us with, and look only to be a blessing to others with every step. 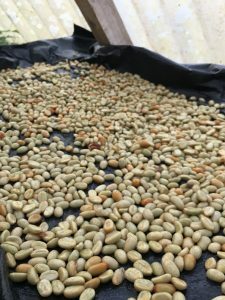 If you ever wonder why some of your favorite coffee costs what it does, let us assure you that with all of the work involved in getting it from farm to table, it is well worth every penny! One way that you can help to support our missionary efforts, provide for the needy in our neighborhood while supporting local farmers and their families at the same time is to participate in our fundraising ministry, Coffee That Counts. This ministry allows for you to raise support for your church, group, missions trip, youth group, or whatever ministry you are involved with in an easy way. We look forward to working with you to support your ministry efforts while you in turn are supporting ours! 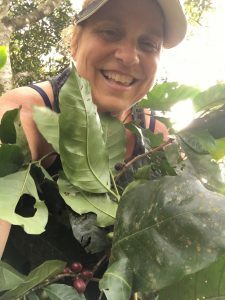 We started with a property right in the middle of long time Costa Rican coffee farming families, and it just seemed like what we were supposed to do! Eager to be a part of the culture and our immediate community, we began preparing the land to receive our coffee starts. 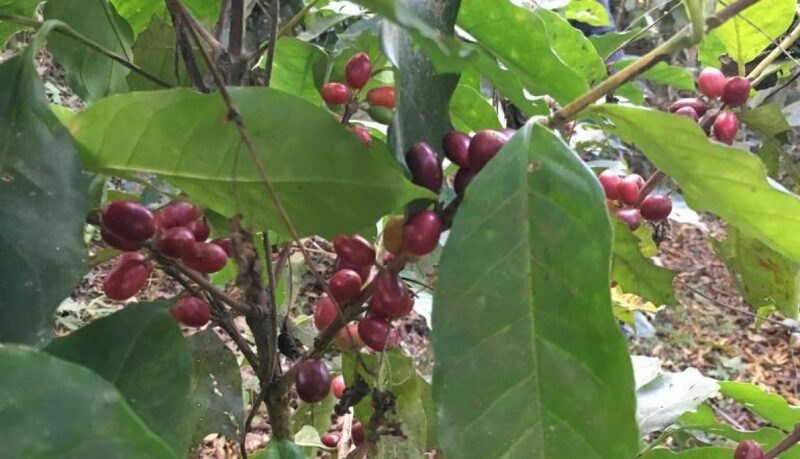 Coffee plants typically take 3-4 years to grow into full maturity for harvesting, so our contribution to Coffee That Counts will hopefully be ready in the not to distant future. Getting ahold of the best type of coffee for our region and the healthiest ‘baby’ plants took some doing, but we were able to have 1000 six month old coffee plants delivered by tractor to our property – there they were, full, green and beautiful, just waiting for a special kind of team to help us get them all planted while the planting time was at hand! Faithful as He always is, God brought just such a team. Pastor Jack Counts from California, along with his worship leader, Gary Izard, dawned their best coffee planting duds to get their hands dirty with the rest of our team, Tim, Tyler, Intern David Johnson, alongside of our Tico friends and helpers Jeank, Kevin, and Daniel, for a long weekend of some of the most exhausting and back breaking work on the side of a hill a man could do in the Costa Rican sun and heat. 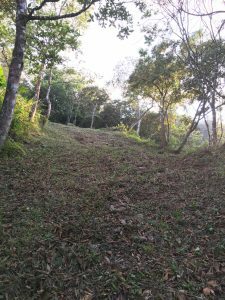 With joy, thanksgiving and praise, the coffee planting team got 1000 beautiful, healthy coffee plants in the ground to decorate our hillside in an artistic fashion mimicking the beauty of the surrounding coffee farms in a start-up kind of way. The team knew that this was the beginning of another outreach opportunity to grow coffee while supporting local farmers, business, and the missionary and fundraising efforts not only our ministry, but of other believers around the world through the business of Coffee That Counts. For more information about Coffee That Counts, it’s mission and how it could benefit you or someone you know, contact us or like Coffee That Counts on Facebook.